Lenogo DVD to iPhone Converter + Video to iPhone Converter: any video you watch on PC can be put on iPhone. 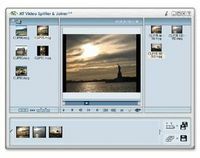 It converts almost all formats of video files that are already on your computer (AVI, MPG, MPEG, ASF, WMV, MOV, 3GP, AMR, FLV, FLIC, SWF, RM, RMVB etc.) and DVD movies into a format that's compatible with iPhone video, that is, iPhone mp4 format. The latest upgraded version 4.2 fully supports the files of Real Media versions 8, 9, 10, and Apple's MOV files (compressed MOV files included) with channels 5.1, 6.1, 7.1.